Devil on the Cross is a book by renowned African author, Ngugi wa Thiong’o. It has been adapted into a play directed by Kgafela oa Magogodi and Simthembile Prince Lamla, that is currently showing at the Wits Theatre. The play follows a young black woman, Nonofatso Merafe, played by Sthobile Hlophe. She is living in newly independent SASASA, a fictional but not-so-fictional African country. Nonofatso’s life is heavily impacted by an unjust colonial legacy – a theme heavily explored in the play – as she struggles with her blackness, experiences with a number of ‘blessers’ and working for a cruel and sexually abusive boss. Frustrated by her situation, Nonofatso attempts suicide. She is saved by a stranger who invites her to a ‘Devil’s Feast’ where corrupt leaders gather and bid to exploit the state resources and its people. Nonofatso makes her way to the Feast in a taxi driven by the charismatic narrator, Roben Skroef Dipanana. In the taxi she encounters Sechaba, a foreign-educated professor whom she later marries. Also in the taxi are war veteran Nkanyamba Leoneria Grootboom, carpenter Sibamu Sibanyoni and Mosebetsi wa Maduna, a businessman. The taxi ride brings together these different characters and tells their individual stories as it provides introspection into the effect of the colonial legacy on each of their characters. Their individual stories, told through a highly theatrical sense, highlight the depth of the connection of the characters’ different forms of oppression and the impact of colonialism on their lives. The exaggerated theatrical approach to the play is done so well as not to come across as being overdone, but rather as placing emphasis on the topic of the legacy of colonialism. The beautifully played music by the live band throughout the play, further carries the depth and feelings of the characters and transports that to the audience. Kgafela oa Magogodi, one of the directors, told Wits Vuvuzela that he thought it was important to tell the story of Devil on the Cross at this time as the play explores themes which are relevant to South Africa. “This story and its themes are, however, not unique to us. The character of the neo-colonial ruling elites and their plunder, of men in power preying on poor women, and of the corrupting influence of former [colonisers] are woven through various stories,” he said. Magogodi added that the exaggerated approach is one that was adopted by black theatre makers from the 1970s onwards and was consistent with the spirit of rebellion. “The mere fact of enlarging oneself becomes a declaration of rebellion. This style is consistent with the politics of the story which we are telling. Making your body loud is about refusing to be erased,” he said. Andisiwe Mpinda, who brings to life the character of Grootboom, told Wits Vuvuzela that her character is a tragic one, for the fact that she lived through the revolution but never enjoyed or saw its fruits. “Nkanyamba is there as a reminder of what was fought for in the past. She is a not so silent whisper of how the dream was altered, of how it did not turn out as envisioned. We need such voices in the contemporary society, especially because we live in a society where there is a systematic sense of amnesia,” Mpinda said. 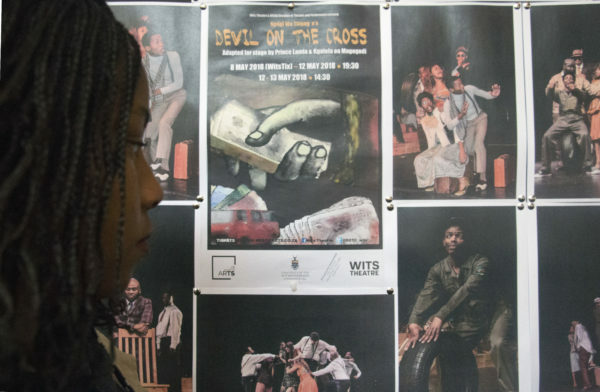 Devil on the Cross is showing at the Wits Theatre until the Saturday, May 19. Tickets cost R50 and are available on Webtickets. Wits Vuvuzela, Movie Review: Avengers Infinity War, May 2018.